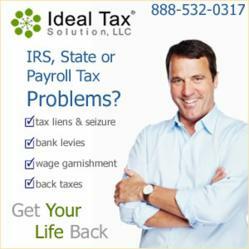 Ideal Tax Solution, LLC is educating taxpayers on the details of a recent IRS announcement made earlier this year regarding inflation adjustments for 2013. The changes will occur as a result of the American Taxpayer Relief Act which was passed in 2012. Our clients know they can count on us for valid, up-to-date news on anything related to the IRS. Ideal Tax Solution, LLC has long realized the important role professional financial service companies play in providing valuable IRS information to its clients and taxpayers in general. The American Taxpayer Relief Act encompasses several new tax items which reflect changes taking effect in 2013, and in large part for returns which will be filed in 2014. As part of a comprehensive approach to tax debt resolution and overall tax liability issues, the professional tax specialists at Ideal Tax Solution maintain an extensive information database on existing and newly implemented IRS tax code policies. The Internal Revenue Service is constantly making tax related announcements related to deductions and exemptions which can directly impact a company or individual’s financial stability. Recent adjustments to tax rate schedules and other aspects of the tax code are numerous and can go easily unnoticed. > A new tax rate on single Americans with incomes of $400,000 or more. Effective this year, 39.6 is the new percentage rate being levied on upper income single taxpayers, with married taxpayers who exceed $450,000 also being subject to the increased rate. > The maximum Earned Income Credit is now $6,044 for taxpayers filing jointly, up from $5,891 for tax year 2012. > The Standard Deduction rises to $6,100 or $12,200 for married couples filing jointly, up from $5,950 and $11,900 respectively for tax year 2012. > And, the Personal Exemption rises to $3,900, up from $3,800 in 2012. These items listed above are but a few of the changes being incorporated into the tax code for 2013. Detailed information on these and other revisions to IRS tax guidelines can be found on the IRS website, or by contacting the tax relief specialists at Ideal Tax Solution. Prioritizing tax information and monitoring changes to IRS tax code policy is daily standard procedure for financial service professionals.